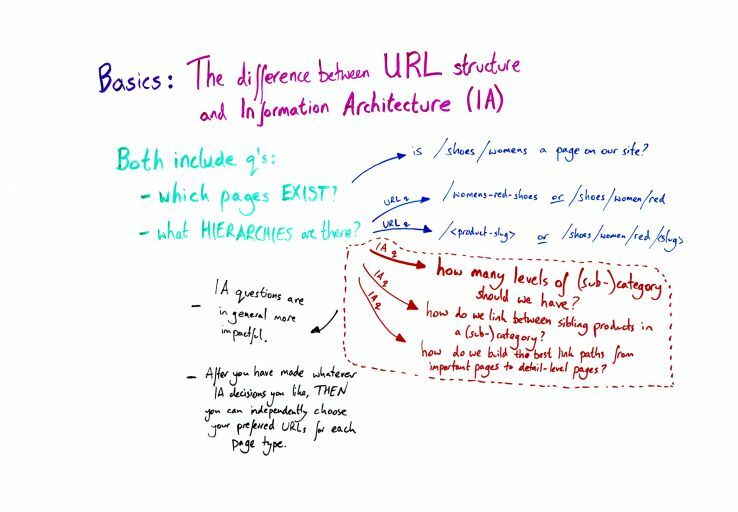 Questions about URL structure and information architecture are easy to get confused, but it’s an important distinction to maintain. 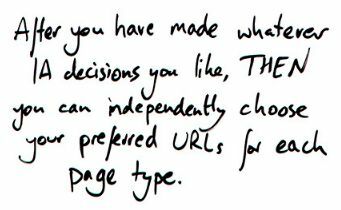 IA tends to be more impactful than URL decisions alone, but advice given around IA often defaults to suggestions on how to best structure your URLs. In this Whiteboard Friday, Will Critchlow helps us distinguish between the two disparate topics and shares some guiding questions to ask about each. Hi, everyone. Welcome to a British Whiteboard Friday. My name is Will Critchlow. I’m one of the founders of Distilled, and I wanted to go back to some basics today. I wanted to cover a little bit of the difference between URL structure and information architecture, because I see these two concepts unfortunately mixed up a little bit too often when people are talking about advice that they want to give. I’m thinking here particularly from an SEO perspective. So there is a much broader study of information architecture. But here we’re thinking really about: What do the search engines care about, and what do users care about when they’re searching? So we’ll link some basics about things like what is URL structure, but we’re essentially talking here about the path, right, the bit that comes after the domain www.example.com/whatever-comes-next. There’s a couple of main ways of structuring your URL. You can have kind of a subfolder type of structure or a much flatter structure where everything is kind of collapsed into the one level. There are pros and cons of different ways of doing this stuff, and there’s a ton of advice. You’re generally trading off considerations around, in general, it’s better to have shorter URLs than longer URLs, but it’s also better, on average, to have your keyword there than not to have your keyword there. These are in tension. So there’s a little bit of art that goes into structuring good URLs. But too often I see people, when they’re really trying to give information architecture advice, ending up talking about URL structure, and I want to just kind of tease those things apart so that we know what we’re talking about. So what pages exist is clearly a URL question at some level. Literally if I go to /shoes/womens, is that a 200 status? Is that a page that returns things on my website? That is, at its basics, a URL question. But zoom out a little bit and say what are the set of pages, what are the groups of pages that exist on my website, and that is an information architecture question, and, in particular, how they’re structured and how those hierarchies come together is an information architecture question. But it’s muddied by the fact that there are hierarchy questions in the URL. So when you’re thinking about your red women’s shoes subcategory page on an e-commerce site, for example, you could structure that in a flat way like this or in a subfolder structure. That’s just a pure URL question. But it gets muddied with the information architecture questions, which we’ll come on to. So if this is a pair of red women’s shoes, then you could have it in /shoes/women/red slug, for example. There are pros and cons of both of these. I’m not going to get deep into it, but in general the point is you can make any of these decisions about your URLs independent of your information architecture questions. Let’s talk about the information architecture, because these are actually, in general, the more impactful questions for your search performance. So these are things like, as I said at the beginning, it’s essentially what pages exist and what are their hierarchies. What’s the link path that you can follow by clicking multiple links from there to get to detail level for every product on your website? Those kind of questions are really impactful. They make a big difference, on an SEO front, both in terms of crawl depth, so literally a search engine spider coming in and saying, “I need to discover all these pages, all these detail-level pages on your website.” So what’s the click depth and crawl path out from those major pages? It’s also a big factor in a link authority sense. Your internal linking structure is how your PageRank and other link metrics get distributed out around your website, and so it’s really critical that you have these great linking paths down into the products, between important products, and between categories and back up the hierarchy. How do we build the best link paths from our important pages down to our detail-level pages and back up? These are SEO information architecture questions, and the critical thing to realize is that you can make all of your information architecture decisions — which pages exist, which subcategories we’re going to have indexed, how we link between sibling products, all of this linking stuff — we can make all these decisions, and then we can say, independently of whatever decisions we made, we can choose any of the URL structures we like for what those actual pages’ paths are, what the URLs are for those pages. We need to not get those muddied, and I see that getting muddied too often. People talk about these decisions as if they’re information architecture questions, and they make them first, when actually you should be making these decisions first and then picking the best, like I said, it’s a bit more art than science sometimes to making the decision between longer URLs, more descriptive URLs, or shorter URL paths. So I hope that’s been a helpful intro to a basic topic. I’ve written a bunch of this stuff up in a blog post, and we’ll link to that. But yeah, I’ve enjoyed this Whiteboard Friday. I hope you have too. See you soon.